Kitchen scales are an incredibly versatile small appliance to have around your home, especially if you’re working towards living a healthier lifestyle. Even if you’re the type of person who prefers to follow recipes based on weight in comparison to cups and tablespoons, you’re going to need a good kitchen scale. The AccuWeight Digital Kitchen Scale is a strong competitor when put up against other brands because it offers some great features that other lackluster designs are missing such as guaranteed accuracy and a multifunctional design. 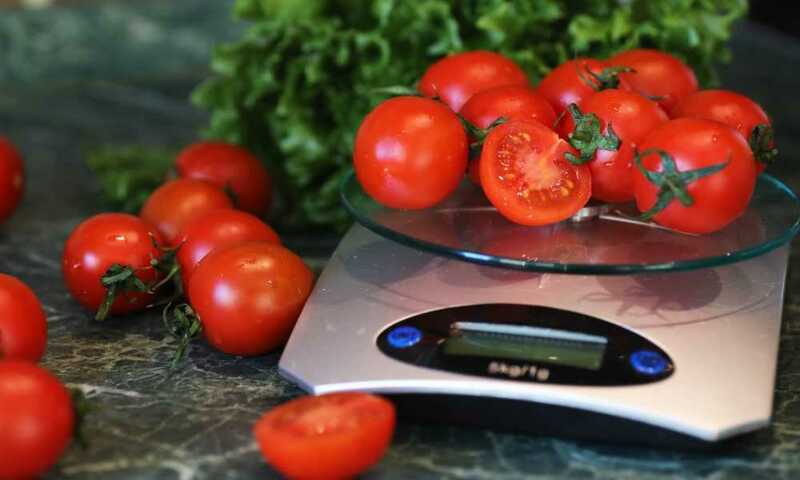 The main purpose of a digital kitchen scale is to give you the ability to weigh your food before you consume it or to weigh ingredients before you include them in a recipe. With this modernized technology, people can monitor exactly how much of each item they’re eating as well as following recipes to make sure every meal comes out perfectly. If you’re the type of person who has always thought about purchasing a kitchen scale but have always been too afraid of trying to understand their features, this is surely the one for you as it boasts a user-friendly interface that even children can use. It’s also the essential kitchen tool for home cooks who are in a rush, as you won’t have to worry about trying to find measuring cups to get the perfect rations for every single item that you’re preparing. Overall, you’ll finally be able to get a clear idea of how much food you’re eating, which is essential for people who have put themselves on meal plans either to gain weight or to lose fat. By taking a few minutes of your time to place your ingredients on the AccuWeight Digital Kitchen Scale, you’ll be able to make the perfect healthy smoothie, bowl of granola or even chicken portion to help you live your best life. However, if you’re not watching your weight and if you prefer to use measuring cups for your recipes instead of adding your ingredients based on weight, this isn’t the right device for you. Once you open the box, you’re going to notice that the scale is ready to use right away as the package comes with the scale, AAA batteries, and an instruction manual. All you have to do is remove the battery casing, install the batteries, and read through the manual to get a clear understanding of the AccuWeight Digital Kitchen Scale’s features as well as any programming options you’d like to set. When it comes to buying a kitchen scale there aren’t very many accessories that you’ll need, aside from the unit itself and you’ll easily be able to use it with items that you already have around your home. In an effort to help preserve the battery life of your kitchen scale, you’ll appreciate the auto-off feature which automatically shuts off the scale once it detects that no items are currently being weighed on its surface. As an important part of any type of measuring appliance, you’ll easily be able to switch between different units (pounds/ounces/fluid ounces/milliliters, and grams) based on the recipe you’re following or your personal preference. In order to get the most reliable measurements possible, the AccuWeight Digital Kitchen Scale offers four different G-force load sensors which allow the scale to measure up to 11 lbs. Although being able to read numerical values on a digital display helps to make the scale more functional than an analog model, it’s important to remember that to read the measurements, you’ll have to stand directly in front of the scale and tilt your head upwards. This can be a little frustrating for busy home cooks who need to see quick and accurate measurements in a flash. Once you’ve decided that it’s time to start shopping for a kitchen scale, you’re going to need to take a few important factors under advisement. First, you’re going to want to find the best model that offers the ability to measure heavy items; second, you’re going to want a device that will compliment your kitchen décor; and third, it’s important to find a scale that is easy to clean. When compared to other kitchen scales, such as the My Weigh Kitchen Scale, the AccuWeight Digital Kitchen Scale seems to be missing a few features that you might find to be essential. By far, the My Weigh Kitchen Scale has a larger weight threshold than the AccuWeight Digital Kitchen Scale as it allows you to weigh items up to 8,000 grams versus only 1,000 grams with the AccuWeight model. Depending on your personal style, you may or may not want to have a flat black scale in your kitchen. This is when the My Weigh unit might be preferable as it is sleek and stainless steel. After weighing, you’re certainly not going to want to spend all of your time trying to clean your scale. Luckily, the My Weigh Kitchen Scale also comes equipped with a removable splashguard that protects the function buttons and screen from dirt and grime. 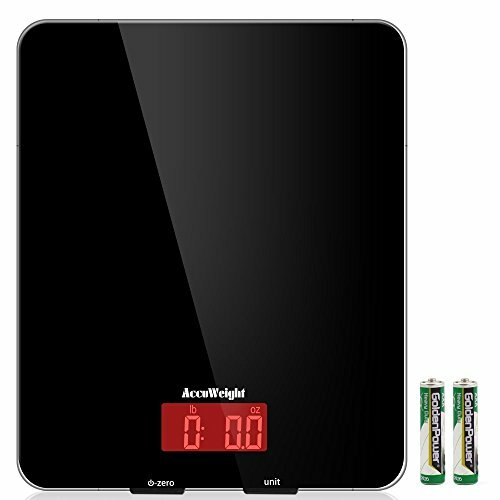 Overall, it’s easy to see how the AccuWeight Digital Kitchen Scale is an affordable and user-friendly small appliance. Once you start using your scale you’ll start to wonder how you ever survived without one in the first place. Designed to make baking, cooking, and portion control simpler, it could easily become the most used item in your home.